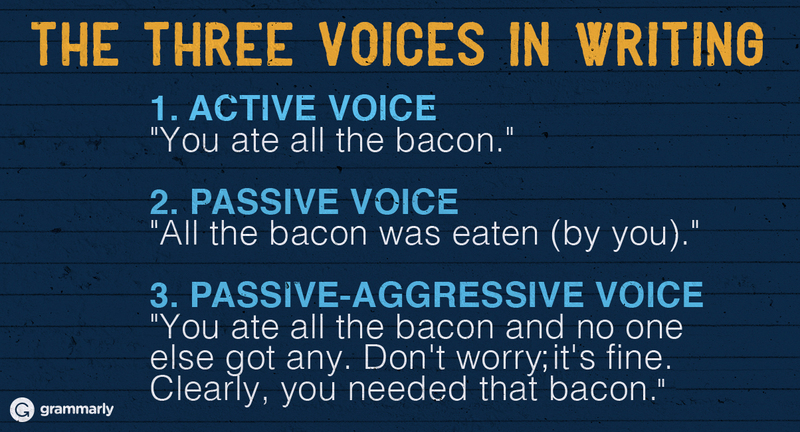 The passive voice is a misunderstood entity in the world of writing. It is unfairly judged by many authors. Some writers, without taking the time to get to know this grammatical structure, avoid it at all costs. Others use it ineffectively because they do not understand how it works. How can you get to know this mysterious literary device? The leaves were blown by the wind. The leaves receive the action of being blown. In the example, the agent is specified with the preposition by. However, the agent could have been left out of the sentence: The leaves were blown. When is it proper to use passive voice? Consider these instances. Why do you suppose passive voice is appropriate? Check your answers below. My camera was stolen from my locker at school. A candle will be lit at the memorial service for the fallen soldier. The sodium hydroxide solution was heated to 200 degrees. Who stole the camera? The agent is unknown. If you do not know who committed an action, it is appropriate to use passive voice. Who do you want to receive the attention? If you prefer the attention to be on the action itself (the candle being lit) and not the person doing the lighting, you may omit the agent. You are expressing a general truth that is applicable to many. Using active voice to express this idea would be awkward: People who make diets make them to be broken. Researchers often use passive voice in scientific reports. It is assumed that the reader knows that the experimenters are performing the actions without stating this fact explicitly. But, according to the University of Toronto, this trend is on the decline. Recent papers tend to contain more examples of active voice. What questions do you have about using passive voice?